Santa's lil Helper badge in red with a white snowball shaped splodge and Santas lil helper written in a red festive font. Also features a red and white Santa hat. These are perfect to give out to your children this Christmas, especially if they are helping to make the festive season even more magical. 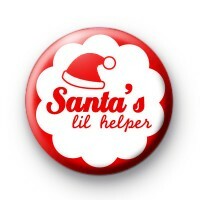 All Santa's little helpers need one of these badges, father christmas can't do all of the work himself. Standard 25mm button badge made in our workshop. We have hundreds of Xmas badges to choose from & offer free delivery on larger orders.